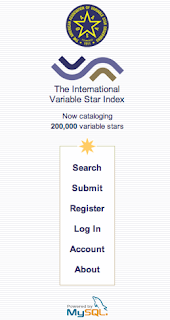 December 22, 2011 the Variable Star Index (VSX), the most complete up to date resource for variable star information on Earth, reached a milestone as we passed the 200,000 mark for variable stars included in the database. The brainchild of Christopher Watson, and donated to the AAVSO, the VSX catalog has been growing steadily over the past few years, with hundreds of new entries, submitted one at a time, and data from surveys being uploaded en masse. In the past year the database has gone through a radical transformation, as Sebastian Otero has spent countless hours cross-checking, eliminating duplications and errors and making dozens of corrections to the existing data, all while moderating submissions of incoming data along with the other moderators of VSX. So this milestone is significant in that we are reasonably sure we actually have 200,000 individual entries in VSX. Another important development that will be announced in the coming weeks, is the creation of a document describing all the variable types contained in VSX, which is part of a larger vision leading to the standardization, more or less, of variable star nomenclature world-wide. I will have more to say about all that n 2012. For now, congratulations to the AAVSO and the VSX administrators and moderators for a job well done.